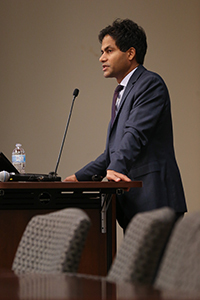 Jameel Jaffer discussed the ways in which social media platforms shape public discourse and the challenges of determining how their content moderation policies suppress or support the right to free speech in his talk, “Digital Journalism and the New Public Square,” at Vanderbilt Law School on Oct. 30. 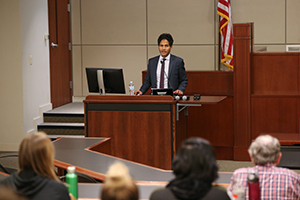 Jaffer visited VLS as the 2018-19 George Barrett Distinguished Practitioner in Residence, a program through which the George Barrett Social Justice Program brings a prominent social justice lawyer to Vanderbilt each year to meet with students and deliver a talk. He is the inaugural director of the Knight First Amendment Institute at Columbia University, having joined Columbia’s faculty after serving as a deputy legal director at the American Civil Liberties Union, where he oversaw the organization’s work on free speech, privacy, technology, national security and international human rights. 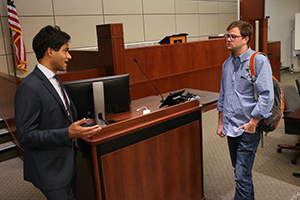 He was introduced by Daniel J. Sharfstein, who holds the Tarkington Chair of Teaching Excellence and directs the George Barrett Social Justice Program. According to Jaffer, the controls Facebook now places on content posted on its platform and the ways it collects and uses information provided by its users are still not clear to government policymakers or academic researchers who study social media.